THE SKINNY: This funny-looking little stick from Tarte packs a punch. This stick is a primer that contains extra pigments to help smooth away your skin's flaws. 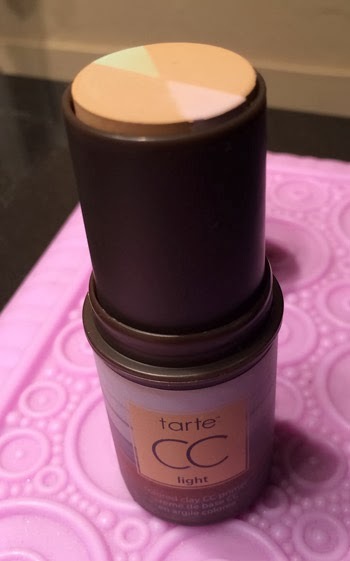 Tarte Colored Clay CC Primer is a new addition to one of my favorite lines and this primer is no exception. I used it a little differently, though. Rather than an all over face primer, I have been using the stick for targeted areas that need a little extra help -- for dark circles under the eyes, to hide redness, etc. And the results are great. The formula is creamy -- not what you might expect from the word clay -- and does a great job hiding those little imperfections. I have pretty light skin and went with light for good coverage. Some other reviews on the Tarte website say other shades run a little dark. So you might want to go try this one out in person before buying. CHECK IT OUT: Tarte Colored Clay CC Primer comes in five shades. Sign up for the Tarte mailing list for a discount, too.